Wallace-Kazer, M. & Grossman, S. (2011). 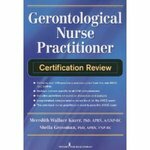 Gerontological Nurse Practitioner (GNP) Certification Review Book. New York, NY: Springer Publishing Company, Inc.
Kazer, Meredith Wallace and Grossman, Sheila, "Gerontological Nurse Practitioner (GNP) Certification Review Book" (2011). Nursing and Health Studies Faculty Book Gallery. 10.